This Lemonade Cake with Lemon Cream Cheese Frosting is an all time favorite recipe! So, my kids won’t eat any lemon flavored baked goods. Lemon cake, lemon pasta, lemon cupcakes, lemon muffins…they say they’re too sour. BUT they drink lemonade, and can’t seem to get enough Sour Patch Kids, Cry Baby Candy, Sour Skittles or Lemon Heads. I even tried once to make Lemonhead Cookies, thinking I had cracked the lemon code, and they were like, nope. Even the other day as I was making this cake, my child SAW me use lemonade in this recipe and STILL says he won’t like it. I DON’T UNDERSTAND!! Anyhow, now here I sit, staring at a giant Lemonade Cake with no one to share in it’s deliciousness with…except maybe you guys…you get it, right? This cake isn’t hard…plus you can make it ahead until you’re ready to frost it…AND it all starts with a boxed cake mix and Frozen Lemonade from concentrate. Good stuff! You have a lemon cake mix, amped up with some lemonade concentrate, topped with a lemonade sugar glaze to keep the cake supremely moist and finished with a creamy, gorgeous, lemonade cream cheese frosting. I even like to make the cake and let the glaze soak into them overnight. You don’t have to do that, but if you’re making this for a special occasion, it’s a really nice option! I topped my cake with some lemon peels, which is, of course, totally optional! Like I said, this Lemonade Cake starts with a lemon boxed cake mix, which is a great shortcut. AND you can make this cake a day ahead, which means it’s perfect for party prep! The cream cheese frosting on this cake is AMAZING! It’s an easy cream cheese frosting recipe, with the addition of lemonade from concentrate. It’s simple, creamy, and the perfect topping for any lemon cake recipe! This ULTRA moist Lemonade Cake is soft, tart, and topped with creamy lemon cream cheese frosting! Preheat oven to 350°. Spray 2, 8″ round cake pans generously with cooking/baking spray. Set aside. In the bowl of your stand mixer fitted with the paddle attachment, mix cake mix, eggs, milk, vegetable oil, and 2 tablespoons of Lemonade from Concentrate on low for 30 seconds, and then on medium for 2 minutes, scraping the sides of the bowl as necessary. Keep the remaining frozen lemonade concentrate in the freezer…you will need it again. Bake for 25-30 minutes or until cake is set and toothpick inserted into the center comes out clean. Let the cakes cool in pan, approximately 1 hour. Do not remove. When the cakes are cooled level them off with a serrated knife, so they are flat on top. If the cakes didn’t dome much and don’t need to be leveled, poke holes with a skewer throughout the top, so the glaze will sink in. In a medium bowl combine powdered sugar, Lemonade from Concentrate and water. Stir until smooth and pour equally over the top of the cakes, still in the cake pans. Cover and let sit for at least an hour, or overnight in the refrigerator is best. In the bowl of your stand mixer, fitted with paddle attachment, mix butter and cream cheese together for 2 minutes on medium speed, until combined and creamy. Turn mixer to low and add your lemonade and vanilla. Slowly add in your powdered sugar and then beat on medium for 1-2 minutes until smooth, scraping the sides of the bowl as necessary. When ready to frost, remove your cakes from the refrigerator. Loosen cake around the edges with a butter knife so they will release easily. Store refrigerated for up to 3 days. Bring to room temperature before serving. Helpful tip… out of sour cream? This recipe was originally posted in 2011 and updated in 2017 with new photos and a video. Oh my goodness! That sounds SO fabulous, Shelly! My son LOVES lemon, so this is going on my "must make" list. And I agree with Kristan….glaze PLUS icing? Winning. oh I LOVE lemon, your cake looks wonderful. I'm so glad my kids just moved past the stage of not liking lemon pasta, they love it now….funny think about the sour candy..LOL kids are so funny. My kids have never had trouble when it came to the lemon desserts though, they always seem to get devoured. I love short cut cakes and this recipe is a keeper for sure! Lemon is my new favorite flavor so I can't wait to try this. Thanks for sharing! I love lemon. I might make this while my family is out of town so I don't have to share! I love, love, love, love, love all things lemon lately and know I'd scarf down this entire cake. It looks absolutely scrumptious, Shelly! I'm in the same situation. nobody wants to eat it.I give it my neighbors. I hope they like the cake. Sorry about my english, because I'm brazilian woman. Let me know how it comes out please when you make it.. I make a very similar sheet cake that is missing your yummy frosting. We make it all summer for cookouts, and with your frosting, I bet it will be an even bigger hit! Thanks. Pretty sure that if you swapped out the lemonade for limeade and a little of the liquids with tequila… you'd have a Margarita Cake. Mmmm. Make one, sprinkle some sea salt on top and mail it to me for Cinco de Mayo, k? I'm definitely trying this one – even if I'm the only one in the house who'll eat it. I LOVE lemon! I do love baking from scratch but I am all for using a cake mix at times. In fact, I think I prefer the texture of cake mix cakes most of the time! They are kind of no fail. This lemon cake sounds delicious. I have 3 young kids and I know they do not appreciate a good lemon dessert but I certainly do. I will have to wait for a special ocassion to arise where I can make this cake to share with others. If I made it and kept it at home, I would be the only one eating it and that just won't work! The lemon glaze I'm sure adds some wonderful moistness & tanginess to the cake. Thanks for this recipe. I can't wait to try it. Your photos are so good it just makes me want to eat a piece right now! Haven't had this in YEARS- thanks for the reminder! I love lemony desserts. This even reminds me of a tres leches cake with the soaking process. Putting the two together tastes great I bet! See I felt like Easter seemed like it would take FOREVER to get here because it was so cold outside until the bitter end! How could it be Easter when we're wearing winter jackets?!?!? Craziness. I think this cake brought in the sun, though. Looks delicious! I love anything lemon….except lemon cleaning products. Can't stand the smell. I also drink coffee by the gallons but can't stomach coffee-flavored ice cream or candy. Can't wait to try the cake….I'm thinking it sounds like a great Mother's Day idea! I have to make a lemon cake very soon for a garden cake! LOVE this recipe! Thanks so much! Can't wait to try it! This sounds so bright and Springy. I can't wait to try this cake. Bookmarked! I just made a lemonade ruffle cake too! Don't know how the inside came out since I gave it away but it SMELLED delicious! Lemon cake – one of my favorites! You've outdone yourself with the glaze and the frosting. YUM! I'd share it with you! We'll just pig out and let the kids drink lemonade! my MIL LOVES lemon and this is her kinda cake . . . of course she'd have to wrestle me for it!! Oh … I need this … now! Oh!My! This looks so moist and delicious… I love lemon cake and this is bookmarked to try! Did you make this cake for me and forgot to ship it to Princeton? It looks so good, perfect for my pregnancy cravings! I love the thought of this cake. It looks so good. Mmmm, my mouth is puckering in anticipation for the zippy zing of that delicious lemony cake! I love anything with cream cheese frosting. Delicious! So. 36 people have already commented on this. I'm gonna have to be number 37! Your cake sounds amazing. The glaze before the icing…yum! What a great looking recipe! Looking forward to trying it! Thanks so much for linking up this week Shelly!! I featured your post on my wrap up! http://tidymom.net/2011/im-lovin-it-wrap-up-5-1-2011/ Have a great weekend! Finished making this cake yesterday and dug right in – it's amazing!! So sweet and delicious – a very small piece goes a long way. Thanks! wow, all I can say is YUM!!! That cream cheese frosting looks incredible. I can't wait to make it! Featuring this today! Looks so yummy and screams summertime! Ok, my mouth actually started watering when I saw this! I'm begging you to come link up this, and other recipes too to my recipe linky/contest? And of course, I have to follow! I can tell just how amazingly moist your cake is!!!! I am a sucker for anything lemon!!! Oh my oh my! I LOVE cake and cupcakes and cookies…a definite sweet tooth (more than one) in my mouth! I am following you now (#2019), so I can see what other treats you share! So excited about this recipe! Looks delicious! this was DELICIOUS! it tasted just like the Costco lemon ice box cake, which everyone knows is FANTASTIC! give this recipe a try if you have not already! Do you think you could do cupcakes? Just alter the baking time? This looks so yummy! yes! i used this recipe for cupcakes, and they turned out amaaaaaaaaazing. i added a smidge more lemonade to the frosting, because i am a sucker for lemony things. oh, also, this recipe makes a lot of frosting if you’re not doing a cake, so i had a bunch left over. i put it in the fridge in a tupperware container and pulled it out a week later to make a whole second batch of cupcakes. i had to fight off the people at work, who all loooooved them. That’s so good to know!! YAY! Awesome! Let me know how it comes out! Post pics on my facebook page if you want ~ I would love to see it! I bet it’d be even BETTER with chocolate icing. I LOVE chocolate/lemon! It would be awesome to do a filling of seedless raspberry jam too, then cover it with the chocolate icing. You could do the same thing with ORANGE concentrate….. the possibilities are endless! Made this cake for my husbands birthday. It’s TOO rich! Next time I’ll just skip the glaze. Let it soak in overnight like it says and it made the cake all spongy and really dense – maybe it’s just too much glaze? It didn’t turn out like the picture where the cake still looks like it has a cake texture. Also, the lemonade concentrate doesn’t make it taste like lemonade to me. Next time I’ll just use lemon juice. Sorry it didn’t come out as you would have hoped. I have made this cake multiple times and haven’t had the cake get too dense, but I am sure it is certainly a matter of preference. Yes, it is a rich, cake for sure. Oh wow I’m making that right now i can’t take it anymore lol? Yummy! I made this cake because it sounded so good and I just love lemon. I wasn’t disappointed. This looks delicious ! Is the butter unsalted or not ? Can you use original cream cheese instead of reduced fat ? Would like to make for Easter ! i always use salted, but that’s a personal preference! And yes, of course you can use regular cream cheese instead of reduced fat!! I made this cake for Easter this weekend and everyone loved it. Thanks for posting on Pinterest. My question to you is, how did you frost it like the picture? I made the cakes the day before so I could refrigerate over night and frost the next morning. My frosting was room temperature when I frosted, but the frosting seemed to crumb the cake up. 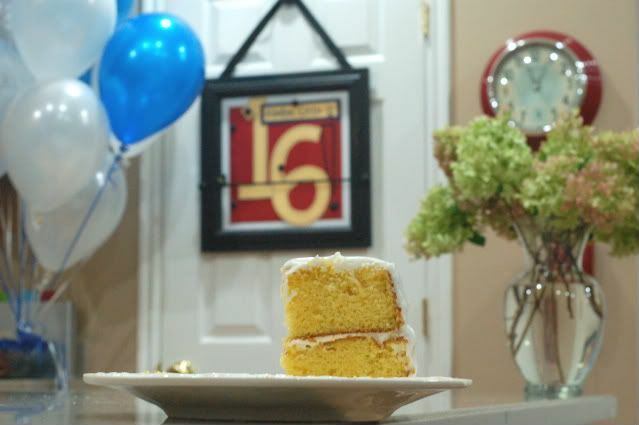 How did you get the frosting so clean and smooth in the picture? Mine had crumbs in it and looked messy, although didn’t change the yummy flavor. I would just like to know for future. I always crumb coat my cakes. WHat that means is icing the cake with a thin layer of frosting, crumbs and all. Let it set up and then go over it with a nice even finish of frosting. The crumb coat seals all the crumbs so they won’t be visible. There are some great tutorials on the internet, just Google, “how to crumb coat a cake”, that’s how I learned! I am making a 2 teired cake tomorrow and she made a last min change to lemonade cake. It is going to be a double layered 6″ and 8″ With the glaze, would this cake fall apart or will it be okay? My mom requested a very lemony cake for her birthday and this one fits the bill. Her birthday is tomorrow so I’ll let you know how it turns out. Thanks for sharing this wonderful looking recipe! The Lemonade cake recipe says to level off cakes (plural) when cool then poke holes in the one that wasn’t cut. Confused. Sounds real good, though. I don’t imagine it will matter whether I poke holes in both or one. All that meant, was if the cake had parts that didn’t need leveling off…sorry, it is worded a little confusing! Has anyone made this using oranges? I have a ton of fresh off the tree oranges around but LOVE the sound of this recipe!!! Just found your recipe on Pinterest!!! It looks and sounds amazing!!! Oh my goodness!!! I forgot all about this cake! My Great Grandma used to make this, I can’t wait to bake it!!! I know that this post is almost 2 years old now, but I want you to know that this has become the FAVORITE cake of my family. I first made it for my boyfriend and he fell in love with it. For the past 2 years I’ve made it for both my Mom and my Grandfather as their birthday cakes. It is so easy and so good! Everyone kept telling me that I should try different flavors- any flavor that you could get both a cake mix and juice concentrate in. So, last week I tried strawberry. I used a Duncan Hines strawberry cake, and the closest thing I could find to juice concentrate: Strawberry Daiquiri. It was almost as good as the lemon version. Almost. Just thought I’d share. Next time I might try orange! LOVE that you tried it with strawberry!! That sounds amazing! Once frosted with the cream cheese frosting does this need to be refridgerated?? And/or once i make it can i put it in the fridge for a day and would the frosting hold up and not fall off??? I don’t imagine the frosting would fall off, but if you are worried, go ahead and make the cake, glaze, it and let it sit in the fridge glazed until the day you’re going to serve it and then frost it then 🙂 Hope this helps! I used a Wilton 1A tip, it’s a large round tip! This cake is fabulous! I took it to work for a birthday- Now you see it-Now you don’t! I made this yesterday for my birthday- superyum! I loved it so much. Thanks for the recipe. Because I’m that kind of girl (calorie conscious), I halved the frosting recipe and it was still plenty for my taste. I was on your site looking for a cake for my sons first birthday on saturday and I found this! It sounds awesome and kind of fits in with our circus theme, and I looove anything lemon! With the icing being lemon, will I still be able to add food coloring? I was planning on a baby blue color…Love all your recipes! Shelly, It is 2015…4 years and counting since you posted this but I just wanted you to know I love this cake! I found it through pinterest. I just finished it today. My 4 kiddos even love it. Definitely a keeper! HA! I forgot about this cake! I need to make it again and update these horrible pictures 🙂 So glad you like it! Just so we’re clear, I should cut the top off of BOTH cakes and poke holes in both cakes and drizzle the glaze over both cakes? The part when you say to poke holes in “the cake that wasn’t cut” that threw me off. Thanks! I cannot wait to try this recipe! This was delicious, the cream cheese frosting came out a little soft. I think next time I will add a little more cream cheese to make the frosting a little stiffer. The cake is made with milk? Is that right? It’s usually made with water. I made this cake and turned out good! The only problem I have is the icing, mine is loose and keeps running of the cake.I added extra powder sugar to try to thicken up but I am having on luck. Can you help? i went through 20-25 recipes before coming upon this one. though comments all from 2011, i am taking a chance and making it for my son’s birthday, today. i added pkg of lemon pudding instead of lemonade. i will use that in glaze and frosting. I would like to try this cake. It looks delicious. Unfortunately, I’m allergic to the vegetable oil. What can I substitute it for and how much of it should I use? I made this cake last night and let it sit overnight in the fridge before frosting it this morning. It has an amazing flavor but the texture is wrong. So very VERY wrong. It is more of a pudding cake than a normal cake. It has no crumb to it. I work in a construction office full of guys who all gave this cake a thumbs down on mouth feel but liked the flavor. I followed the recipe and only deviations made was on the frosting — I did used considerably less sugar and upped the lemon flavor. Could you make this in a 9 x 13 pan? I haven’t, but I don’t see any reason that it wouldn’t work! I have actually used both sizes in this cake and the results really are about the same! Can this be made in 9 x 13 cake pan? What adjustments would you make on baking time and frosting amounts? Yes for sure. I would bake it for 25 minutes to start and test from from there. And you could cut the frosting by 1/3 if you are only frosting the top of the 9×13. …this is a very delicious cake!! I’ve made it about three times and its always a winner!!! I’m always looking for reviews of a recipe. All I see is remarks as to how good “it looks”!! Has anyone tried this recipe? This cake looks fabulous. I need to make a dessert in a 9×13 pan and freeze it take to a retreat. Do you think this would freeze? Yes it should be fine! Would adding a packet of lemon pudding mix to the cake be a terrible idea? I usually do it to my boxed cakes but I’m hesitating for this one lol. It might be a lot of lemon flavor if you do! I made this cake last night, but as a 13×9. Baked for 28 minutes. It was super moist, delicious and a hit with my family! Loved the tangy, tart lemon flavor! This recipe is a ‘keeper’ as the lemon flavor on every level is what makes this so good!